Preschool Combination classes work with students throughout a season on three disciplines of dance in a single 45 minute class once a week. Students learn introductory technique and skills for each discipline and participate in our year end showcase with a recital routine. This class is meant as a feeder into our full year recreational programs and is an opportunity for students to try different styles of dance before making a decision to pursue one for an entire year. 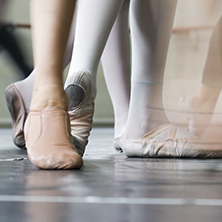 We offer one Preschool Dance Option at our studio; Jazz/Acro/Ballet.